S Ganesan. Non Traumatic Clavicular Disorder: A Diagnostic Challenge. The Internet Journal of Orthopedic Surgery. 2006 Volume 5 Number 1. Lesions involving the clavicle are usually traumatic. When one comes across a lesion with out any preceding history of trauma, the diagnosis becomes difficult. This article helps to review some of the common conditions affecting the clavicle and thereby helps in establishing the diagnosis. The clavicle is one of the commonest bones to be involved in fracture both in children and in adults. The management algorithm for clavicle fracture has been widely described in the literature. But there is not much report on non traumatic lesions of clavicle. Clavicle like any other bone is affected by various causes, but the diagnosis becomes difficult as the reported incidence is low and most of the lesions lack the characteristic appearance thereby posing a diagnostic challenge. Like any other pathology lesions involving the clavicle can be grouped as congenital, developmental, metabolic, endocrinal, inflammatory, traumatic, neoplastic which helps in establishing the diagnosis. The age group of patient and the site of lesion may some time help in establishing the diagnosis. Like other bony lesions, clavicular lesion has also predilection to different age groups. Conditions like infantile cortical hyper ostosis, Chronic recurrent Multifocal osteomyelitis are common in children where as conditions like Condensing osteitis , Distal Osteolysis of clavicle, Friedrichs disease, non suppurative periostistis are common in adult. Tumors follow the general rule as any other skeletal tumors. Though non traumatic lesions are more common in lateral third of clavicle, some of the lesions like Freidrich`s disease, condensing osteitis, sternocosto clavicular hyper ostosis are quiet common at the medial end. Some of the common disorders affecting clavicle in this age group are Birth Fracture, Congenital Defects of Clavicle, Congenital Pseudoarthrosis of Clavicle , Cleido cranial dysplasia, Short Clavicle syndrome, Infantile Cortical Hyperostosis, Bacterial Osteomyelitis, Non suppurative Periostistis ( CRMO), Hyper-vitaminosis A, D, and some of the neoplastic conditions. Birth fractures account for 0.5-0.9% of normal deliveries. Usually they are associated with difficult labour 16 . Some of the children can have accompanying brachial plexus injuries. Paucity of movements of the affected upper limb with a history of difficult labour should raise a suspicion of fracture. Usually they heal without any residual problems. The differential diagnosis for birth fracture includes congenital pseudoarthrosis of clavicle, congenital defects of clavicle. Congenital pseudoarthrosis of clavicle involves right side more common than the left side. If found on left side dextrocardia should be suspected as one of the theory behind its orgin is pressure from subclavian artery 17. Radiologically it is characterized by smooth sclerosis of the fracture ends. Rarely it is symptomatic with difficulty in shoulder movements and cosmesis, if that is the case, it can be managed with bone grafting and plate osteosynthesis.But brachial plexus palsy has been reported with surgical management 18. Congenital defect of the clavicle is usually associated with syndromes. The other condition which we should be aware of in children is Cleido cranial dysplasia which is part of generalized skeletal dysplasia, where there is hypoplasia or total absence of clavicle. Infantile cortical hyperostosis (Caffey`s Disease) is characterized by painful periosteal elevation and increased sclerosis of clavicle in infants .The other bones commonly involved are the subcutaneous bones like mandible, tibia, ulna, ribs, scapula, femur 10. They are characterized by fever, increase in inflammatory markers but are nonsuppurative in nature and do not need surgical intervention or antibiotic treatment. Usually they resolve with in 2-3 years without any sequlae. Bacterial Osteomyelitis of clavicle is quiet rare accounting for 1-5% of pediatric patients with osteitis 7. Usually they arise by contiguous spread from head and neck surgery 13or following insertion of subclavian catheters11 . Chronic Recurrent Multifocal osteomyelitis is a nonsuppurative periostistis of the clavicle. As the name suggests other bones are also involved, they are characterized by indolent course with remissions and exacerbations, periosteal elevation and new bone formation and increased sclerosis in addition to osteolytic lesion 7 (fig 1). Blood investigations reveal raised inflammatory markers and histopathology is characterized by acute inflammatory infiltrates in the beginning, followed by chronic inflammatory infiltrates and are almost always culture negative 7. They are the adult equivalent to SAPHO and may be associated with acne or pustulosis 7 (Fig 2) .They show dramatic improvement with nonsteroidal anti inflammtories and do not require antibiotic treatment 7,11and resolve spontaneously by 2-3 years. Figure 1: CROM in 14 year old characterized by periosteal elevation and new bone formation. Culture and biopsy were negative. 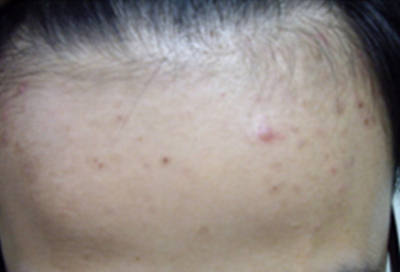 Figure 2: Same patient had acne over the forehead. Like children adults are also affected by non suppurative periostistis of clavicle. They have been described as Sternocosto clavicular hyperostosis (SCCH) 16, SAPHO 7,16(synovitis, acne, pustulosis, hyperostosis, and osteitis). But they share common features characterized by periosteal elevation, sclerosis and have multi focal involvement. They also show raised inflammatory markers on blood investigations and are usually culture negative. Some of these individuals have features of spondyloarthropathy 16and may suffer from uveitis, inflammatory bowel disorders, spondylitis, and sacroilitis and should be considered for investigations by antinuclear antibodies. The treatment is symptomatic with nonsteroidal anti-inflammtories and diseases modifying agents has also been tried. The other conditions which commonly affect the adults are associated with recurrent trauma/overuse syndromes. Anterior Subluxation of clavicle is seen in individuals who participate in overhead sports activities. Diagnosis becomes difficult as it is difficult to interpret an AP radiograph. and a radiograph of the sternocalvicular joint with 40` cephald projection has been suggested. CT scan also would be very useful in identifying the lesions. Most of them would need only symptomatic treatment. Distal osteolysis of the clavicle has been noticed in professional weightlifters 3 and most of them disappeared with modification of the weightlifting program. Condensing osteitis is also one of the overuse syndromes which have been reported in literature 16. They are characterized by increased sclerosis of the medial end of clavicle. Freidrich`s disease is osteonecrosis of either end of the clavicle, more common on the medial side and becomes a differential diagnosis as they are also characterized by increased sclerosis. The reported incidence of tumor involving the clavicle is 0.73% 5. Malignancy is four times more common than benign lesion 12. Most of the bone tumors have been reported in clavicle. The diagnosis becomes difficult because of the peculiar shape of the bone and absence of characteristic findings as in other long bones. Some of the tumors which has been reported are Osteochondroma, Osteoid osteoma, Aneurysmal bone cyst, Neurofibromatosis, Eosinophilic granuloma, Paget's disease, Fibrous dysplasia, Osteosarcoma, Ewings sarcoma, Hodgkin's lymphoma, Radiation induced tumors, Myeloma, Secondaries. Diagnosis of non traumatic clavicular is not very obvious because of its low incidence of involvement in skeletal pathology. Though the chance of malignancy is very low it becomes essential to exclude malignancy. An awareness of lesions involving the clavicle helps us to establish a diagnosis and make a management plan.